This eagerly-awaited highlight in our golfing calendar will be on Thursday 30th November (not the 23rd as appears in the club diary.) The comp on the 23rd will be an IBS. The Christmas competition list & format will be posted in the locker room after our Thursday Medal round on 2nd November, so get cracking to make up your four-ball soon. There will be a change to the charitable element of our Christmas comp this year. 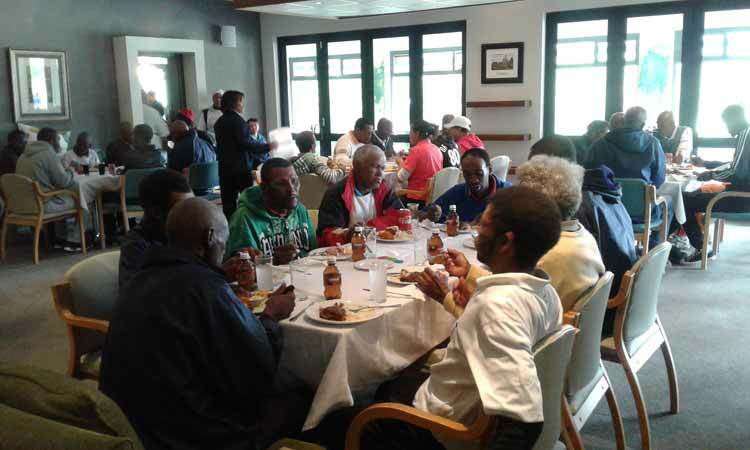 The Ladies’ Committee has decided to make up Christmas Boxes for our caddies (similar to the kids’ shoebox project) instead of collecting food & toiletries for Loerihof & local feeding schemes. Tanya Lightly will be collecting donations after golf from 19th November…so dig deep! On the subject of charitable donations, Bev McKenna & myself are thrilled to announce that a fantastic R9,450 has been collected for the Knysna Santa Box project for local underprivileged children. Our sincere thanks go to all the ladies (& many of our gentlemen) who have generously – and regularly – ‘de-cluttered’ their wallets for this worthy cause. We have decided to make up 50 packs of goodies for 7 & 8 year old boys & girls at a local primary school. We mooted 60, but took the view that we would prefer to do 50 quality packs rather that 60 mediocre ones. Bev & I have been busy bulk purchasing the items & will finish our mega-shop next week. Kelly Picken of The Knysna Santabox appeal will be supplying us with 50 back-packs & sweets. The Club will provide the following contents: a outfit of clothing, 2 toys/games, facecloth, soap & toothbrush, school pen/pencil sets & writing/drawing paper. We are particularly grateful to our dentist Captain Sunet Venter for providing toothpaste for each kid & Debby McClelland for donating several notepads on her company’s behalf. The Club’s vice-captain, Kevin Horrock, has also promised more writing pads from his company, PSG. So far, we are within our budget of R180 per child, so you will be glad to know that we will not need to rattle our shoebox for further donations…rather put your money in the Caddy Xmas box! If we have some cash left over, we’ll put a Christmas cracker in the kids’ back-packs. We intend to fill the 50 packs on Monday 30th October from 9am at the club, but need to confirm with Quinten. Bev & I will be asking for 3 or 4 volunteers to help next week – we’ll talk about it next Thursday. There will be a small welcome reception for all new lady members after golf on February 1st next year at which drinks & snacks will be served. Do make a point of being there to welcome the new faces & extend your circle of golfing friends. Congratulations to our junior Lizzie Lightley who won the Goose Valley Open with a splendid score of 79. 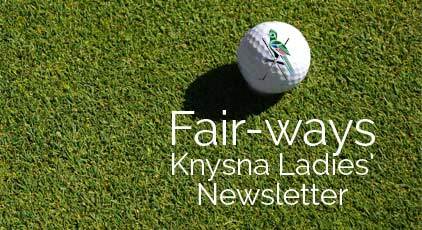 She was also runner-up in the Knysna Junior Order of Merit event – so she’s definitely on a roll. Well done. Under the stewardship of Captain Sean Tanner, the club is launching a new Youth Development Membership scheme to discover 12 budding young players. It’s open to boys & girls from families whose financial circumstances would otherwise preclude them from playing golf, and is designed to help youngsters under the age of 21 to take up the game and improve their skills. The club has already had a number of applications following our Facebook & website posts – and we hope for many more as a result of the advert we’ve placed in this week’s Action Ads.